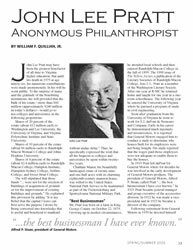 William F. Quillian Jr. was born in Nashville, Tennessee in 1913. He received his A.B. degree at Emory University and his Ph.D. at Yale University. Dr. Quillian taught philosophy at Gettysburg College and Ohio Wesleyan University before coming to Randolph-Macon Woman’s College, where he served as president from 1952-1978. For the next ten years, from 1978-1988, he was a senior vice president at Central Fidelity Bank. He then joined the Greater Lynchburg Community Trust, where he served as executive director from 1988-1997. Dr. Quillian and his wife, Margaret, continue to make their home in Lynchburg. His last article for Lynch’s Ferry appeared in the Spring/Summer 2004 issue.